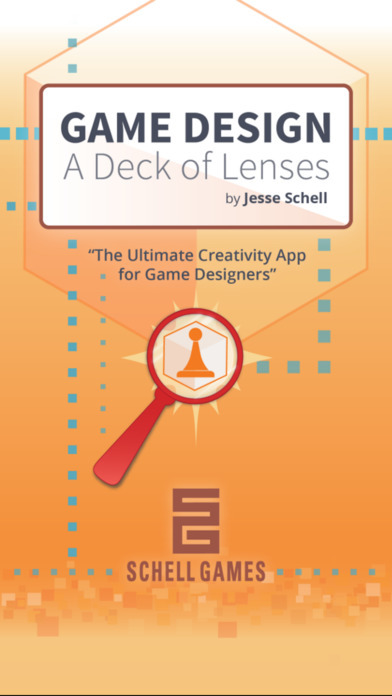 Someone mentioned the app Game Design: A Deck of Lenses on r/tabletopgamedesign and I was happy to try it out for myself. The App is a companion to a book of the same title by Jesse Schell (which I have yet to read). Essentially the app acts as a deck of note cards for game designers. On the bottom of the menu game design fundamentals are broken up into the effected parties or concepts: Designer, Player, Experience, Process, Game. Each tab has around 20-40 individual slides, or lenses, that prompt you to consider a certain concept or experience. What fantasy does my world fulfill? Who does the player fantasize about being? I appreciate that the app tries to do one thing and it does it very well. The design and images are simple but effective, navigation is clear, and the questions are interesting and helpful. I also appreciate the ability to save my favorite lenses. Despite being able to cruise through quite a few of the lenses in a single sitting (if you are diligent) each new project or iteration could necessitate another look at the app and makes the tiny app worth keeping on my phone for awhile.